According to Box Office Mojo, 18 films adapted from comic books took in over $150 million. 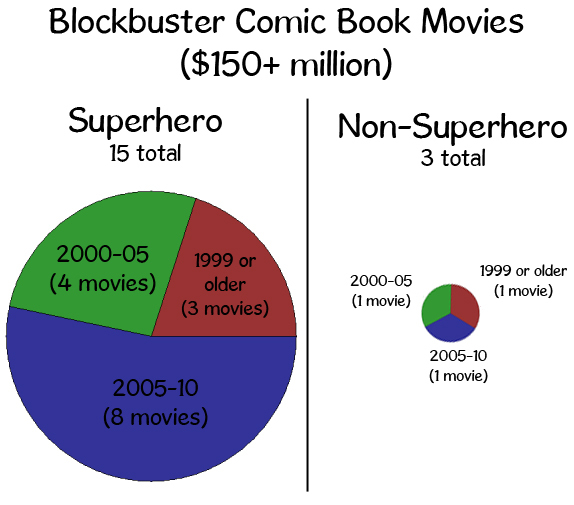 All but three of these blockbusters (Men in Black, MIB II and 300) were superhero movies. Of the 15 superhero blockbusters, 8 came out from 2005-2010, 4 came out from 2000-2005, and just the three early Batman movies came out before that. Another 19 films adapted from comic books took in $75-150 million. Of these, 12 were superhero movies. Of the superhero movies, 6 came out from 2005-2010, 3 came out from 2000-2005, and 3 were older than that (Superman, Superman II and Batman & Robin). 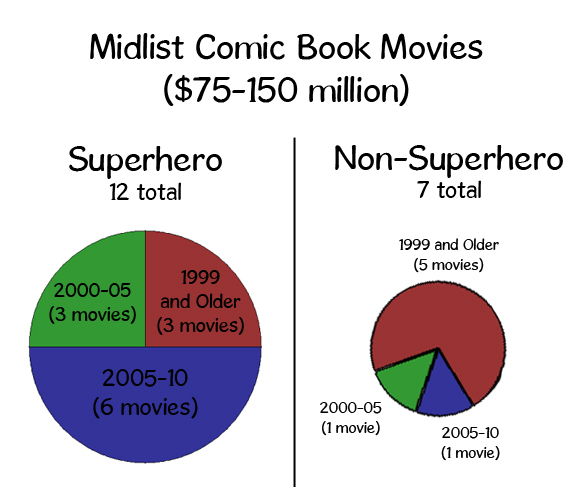 The non-superhero movies tended to be significantly older. The only non-superhero movie from 2005-2010 in this range was Wanted (possibly*). From 2000-2005, there was only Road to Perdition. Then there were five older ones. *The Wanted comics feature superheroes and supervillains quite prominently. The movie used assassins instead. (Other murky calls: I consider Blade, Constantine and Hellboy to be superheroes, but not the Teenage Mutant Ninja Turtles).